Ok so today a friend for her birthday wanted to go to the Big Splash Adventure. 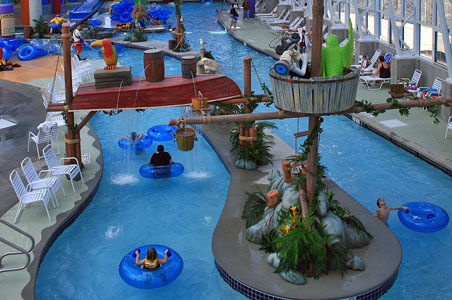 Which if you read the title you would know that it is a indoor waterpark. Here is their web page if you are curious http://www.bigsplashadventure.com/ . So this place is easily a 90 minute drive. So we get up early then we get ready and pack the needed things i.e. towels, dry clothes, etc. So we are now ready to leave we leave our house and drive to her house and pick her up. Then we are off but first we must stop at the bank to pay the car payment. Then we stop at McDonald’s for some breakfast. On a side note they have really good oatmeal. Now back to the story. Finally we are on the interstate driving toward a city named French Lick, IN. Weird name but nice small town. They have a casino and an indoor waterpark and hmmmm that is about it. So we are driving down the I-64 doing roughly 75 miles per hour. Yeah I was speeding but only 5 over. When you get to the tell city exit you have to drive on this little 2 lane highway the rest of the way. We are getting close and the friend whose birthday it was called her boyfriend to see where they are. He answered and said that they were at the casino but were heading out to go to the waterpark. get in the line and stand there for at least 20 minutes. By the time we get to the front of the line we figure out we are in the right line it was amazing. We pay for our tickets and walk into the park. First thing that crosses is my mind wow this is a lot smaller that I thought it would be. This place is probably the size of a football field. They have 4 water slides adult oriented, a lazy river (more on this later), hot tub, kiddie area, and that is it. It cost 19.50 a person to get into and by the time we arrived there was an estimated 1500 people in the place. We find the lockers to put our stuff in and notice you have to get a wrist band. So we go back to the same line as the ticket line and wait again. Finally get to the front. So we change into swimming clothes and I take the stuff out to the car. It is 39 degrees outside and I am where a T-shirt and swimming trunks. I am freezing. We go in to the park again and finally start to do things. First stop the Lazy River. We get in, we get our intertubes, and start to float. The water is warm it feels pretty good. The problem is you can not move once you are in the River. It is packed. You try not to touch someone but you can’t help it. This river is made to just lay on a raft and float around. Why do KIDS insist on getting in there and running around it as fast as they can. It is annoying. Next we do the slides. At least we did 2 of them the lines were horrible. Then of to the Hot tub to be honest this was the only thing that made this place decent, it is sad. So now everyone is hungry and there is only one place to get food in this place and the line is long. It took one of the guys 30 minutes to get a drink. So we are wet and all of our stuff is in the car. Once again let me remind you that it is 39 degrees outside when we left it was snowing. We left got something to eat and went back. You could tell though no-one wanted to return but when you pay that much and drive that far what else you going to do. The wife and I had almost booked a weekend there, good thing we didn’t, and if we had we would be canceling it. Maybe I am being a bit harsh, but this is my opinion.